A beautiful selection of fairy tale illustrations from the Golden Age, back when it was all drawn and coloured by hand, this book presents artworks by a little less than two dozen artists. Of all them, I liked:- The illustration for "The Little Mermaid" by Mabel Lucie Attwell.- The illustrations for "The Garden of Paradise" and "The Snow Queen" by A. Duncan Carse.- Everything by Harry Clarke (he's really good! ).- The illustrations for knightly tales most especially, and the one for "Little Red Riding Hood" by Herbert Cole.- "Snow White" and "Beauty and the Beast" by Walter Crane. The latter illustration is in my top best depictions of the characters from that tale.- Everything by Gustave Doré. I can't choose, he's just amazing.- The art for "Sleeping Beauty," "The Snow Queen" and "The Garden of Paradise" by Edmund Dulac. I like how he makes his people wear French clothing from the period. On the other hand, I've never liked his "Beauty and the Beast" illustrations because of how Oriental they are when the tale is so quintaessentially French (I'm speaking of the Villeneuve and Beaumont versions, not of the tale type, which exists the world over).- The artworks for "Sleeping Beauty," "The Frog Prince" and "Snow White" by Charles Folkard.- Everything by Harold J. Ford, but especially the pieces entitled "Sigurd and Helga," "Lovely ilonka," "The Little Mermaid," and the Arthuran legend "Lancelot and Guinevere. "- All pieces by Warwick Goble, especially those done for "The Frog Prince," "Little Red Riding Hood," "The Yellow Dwarf," "Little Snowdrop," and "The Six Swans. "- "Boots and the Troll" and "East o' the Sun and West o' the Moon" by Reginald Knowles.- "The Twelve Dancing Princesses" by Kay Nielsen, even though it's not her most visually striking work included here.- While Noel Pocock, a new artist for me, is very talented, I didn't like his style in the least.- My absolute favourite fairy tale illustrator, Arthur Rackham. I refuse to choose just one example of his work included in the collection, all of it was quite great even though a few of his best are missing. Probably due to space...- Louis Rhead was another artist unknown to me till now. I did like his "Ice Maiden" illustrations best.- W. Heath Robinson and Charles Robinson, everything selected from their artistic production was fairly good, and I have no particular favourite.- "The Red Shoes" and "The Fellow Traveller" by Helen Stratton and the illustration for the same folktale, entitled "The Travelling Companion," by Hans Tegner.- The illustrations for Madame d'Aulnoy's literary fairy tale "Gracieuse et Percinet" by Gustaf Tenggren.- "Ole Lukote" by Milo Winter. He has a lovely style that resembles oil paintings.The collection's flaw is that it's too slim. It could've included more artists, or at least more examples of works by those included. I'm guessing that the editor may have chosen within the restrictions of a timeframe, but that's not very convincing because there are other artists that were contemporaries or near-contemporaries of those included that were ignored anyway. Scandinavian and Russian artists are the ones that come more quickly to mind when I think of those left behind, and I'm hoping the editor will consider publishing new volumes including them.For that reason and because i don't think some of the pieces selected were the best to showcase those talented people's work, I'm giving this book only four instead of more stars. 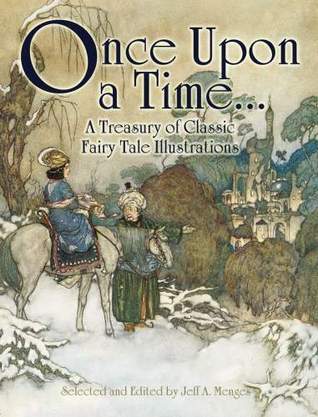 Overall, it's still very recommended for old-school art and fairy tale enthusiasts. An impressive collection of fairy-tale illustrations ranging from the 1880s to the 1920s, with iconic artists like Warwick Goble and Arthur Rackham alongside ones more obscure and unjustly forgotten (I am grateful to this book for introducing me to a range of new artists, especially Elenore Abbott and Noel Pocock). I was, however, surprised by the omission of John Bauer. There's a nicely broad range of art styles here, from the sugary elf-children of Mabel Lucie Atwell, through Gustave Dore's dark, Freudian interpretation of Little Red Riding Hood and the nightmarish pen-and-ink forest of skeletons drawn by Helen Stratton to the noble, pre-Raphelite inspired knights and ladies of Harold J. Ford. The fact that the same themes and motifs crop up again and again- swan Princes, Snow Queens and mermaids abound- actually serves to bring out the differences in the artists' styles. My personal favourite piece was Herbert Cole's "Father Time and the Fairies", a striking illustration from a lesser-known story. A link to said image here. An aesthetically pleasing treasury.